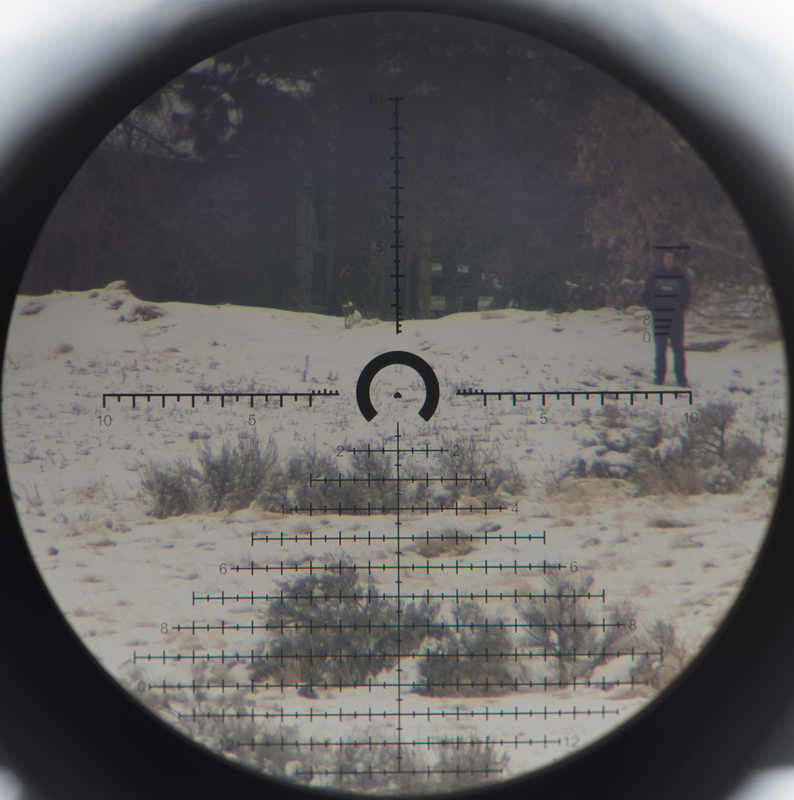 Although second focal plane scopes continue to be the most common type among hunters and shooters, first focal plane scopes have become more and more popular, because you can use reticle sub-tension markings to adjust for elevation and windage, rather than taking the time to adjust the scope’s turrets. First focal plane scopes are particularly popular with precision rifle competitors, and military users, where rapid target engagement is desirable. After using a few first focal plane scopes, I have become a convert to that format, and recently sold my last second focal plane scope. All of my current long range optics are first focal plane scopes with milradian reticles and milradian turrets. Build quality: The scope feels pretty solid and well built. According to the materials that came with the scope, the optics are nitrogen purged, which should prevent them from fogging up. The dials are smooth and do not bind or catch. The turrets are a bit soft, and the individual clicks are not quite as positive as on higher end scopes, but they are not bad, and you can feel the individual clicks when turning the turrets, so you don’t need to look when making adjustments; you can do it by feel alone. The center part of the reticle is illuminated for shooting in low light conditions. One of the features I really like about this scope is how the illumination is adjusted. Rather than a single on-off switch or a sliding scale for illumination intensity, the illumination knob alternates between intensity settings and fully off. (Dial reads, 1; off; 2; off; 3; off; etc.) What this means, is that you can turn the reticle to your favored intensity setting, turn it off, and then turn it back to your favored setting again with just one click of the knob. This is not a game changing feature, but it’s a thoughtful one, and shows the attention to detail that the designers have put into this scope. The reticle design itself is one of my favorite reticles I’ive seen on any scope at any price. Primary Arms call this reticle the ACSS R-Grid Reticle. I have no idea what ACSS stands for or why it’s called “R-Grid,” but I don’t really care. I just love this reticle. The point of aim is highlighted with a large horseshoe shaped part-circle, that quickly directs your eye to the aiming point in the center, which is marked by a pointy chevron. In use, I have found target acquisition to be substantially aided by this reticle design. In illuminated mode, both the “horseshoe” and the chevron are lit up in red. 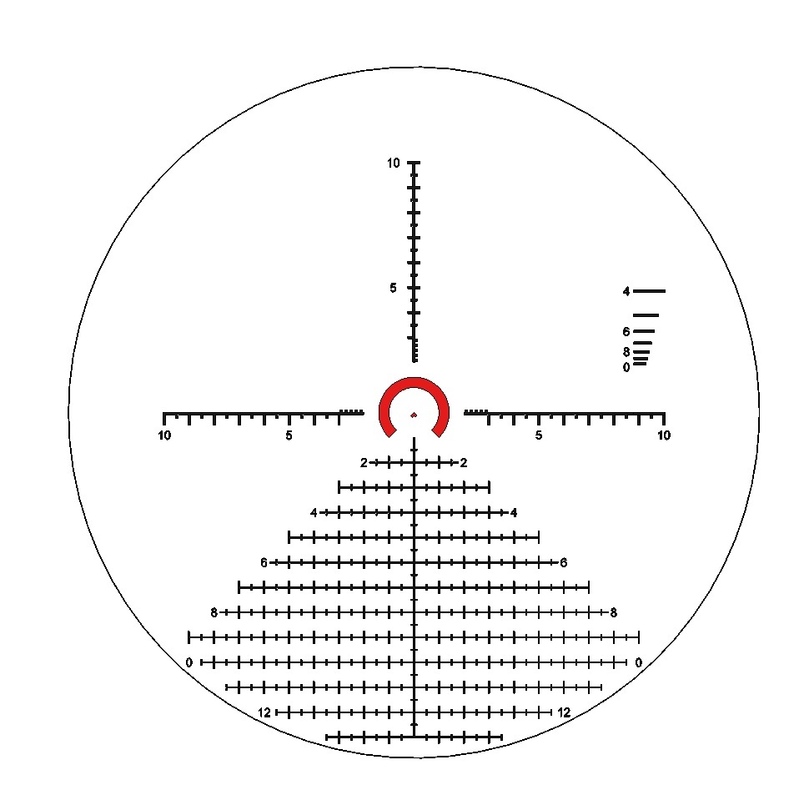 The bottom portion of the reticle is a “Christmas tree” grid, marked off with half mil increments, with numbers at 2, 4, 6, 8, and 10 mils. I am a fan of Christmas tree grids, (I also love the AMR reticle on my Kahles 624i) as they allow for very quick and easy holdovers when adjusting for various ranges without twirling the turrets. In addition to using the mil markings for holdovers for windage and elevation, the reticle also has some clever features for range estimation. The horizontal lines on the upper right quadrant of the reticle are correlated to the size of a man at various ranges. Line up the person’s feet on the main line, and where his head is will tell you his range. In the photo below, the person’s head lines up with the “4” mark. This indicates that he is at approximately 400 yards away. (I ranged him with my Vectronix PLRF 15, and his actual range was 412 yards) Similarly, the width of these range markers correlate with the approximate width of a man’s shoulders. As you can see from the photo below, the width of the man’s shoulders is approximately equal to the width on the 400 yard range line. The quality of the glass in this scope is surprisingly good for a scope in this price range. It’s not comparable to the glass in my Kahles, Nightforce, or IOR scopes, but those scopes cost 10 times more money. For a scope with a max 14x magnification, glass quality is perfectly good, even in low light and maximum magnification. In shooting at ranges between 50 to 500 yards, I have found the turret adjustments to be accurate and consistent. I have not mounted these scopes on my bigger rifles (most powerful is a 6.5 Creedmoor) so I don’t know how it performs on a heavy recoiling rifle. However, for my purposes, I have had no complaints at all. Bottom line, I’m very pleased with this scope. I can highly recommend it to anyone who wants a good first focal plane scope for hunting or target shooting at a reasonable price. This entry was posted in Guns and Shooting and tagged 4-14, First Focal Plane, Primary Arms, r grid reticle, scope by Kai. Bookmark the permalink.